This Crockpot Healthy Buffalo Chicken Dip uses cauliflower so it’s packed with hidden veggies and so creamy! A healthy, gluten free appetizer for game day! 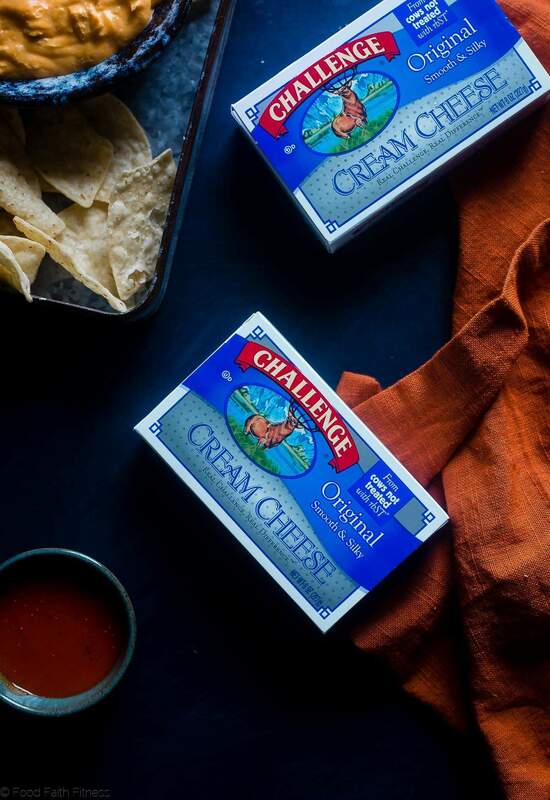 Just wanted you to letchu know that this creamy & spicy post is sponsored by my friends over at Challenge Dairy! We’re over half way through January and we have not yet consumed O-N-E buffalo chicken recipe. You’d think I don’t understand football or something. Am I the only person that thinks that is a RLY sad mental picture? I probably am. You’re probably still trying to figure out how to imagine buffalo chicken in a football jersey. Either way. I may not understand football (much to the sadness of my football-loving-Huborama) but I do understand that the big Game Day requires ALLLLLLLLL the snacks. Snacks are truly the only reason why I have motivation to watch football. Really, if I’m being honest, snacks are the only reason that I have motivation to do ANYTHING in life. I’m PREE sure that you’re 100% agreeing with me right now. Last year, we went CRAY with all the super-unique-and-creative buffalo recipes: we had Buffalo chicken egg muffins, vegan buffalo patties, and even a Buffalo chicken paleo sweet potato hash (because buffalo breakfast = win!) But then, this year, Mr. FFF asked me if I could maybe a normal person for once, and make a classic crockpot keto buffalo chicken dip recipe. So I made him Crock Pot Low Carb Buffalo Chicken Soup instead, thinking it was CLOSE to a dip. He still wanted dip. Ugh. Which means you might have secretly been hoping for this too. So, I made it for you, but super easy-peasy-5 ingredients-in a CROCK POT. You’re excited. I’m excited. 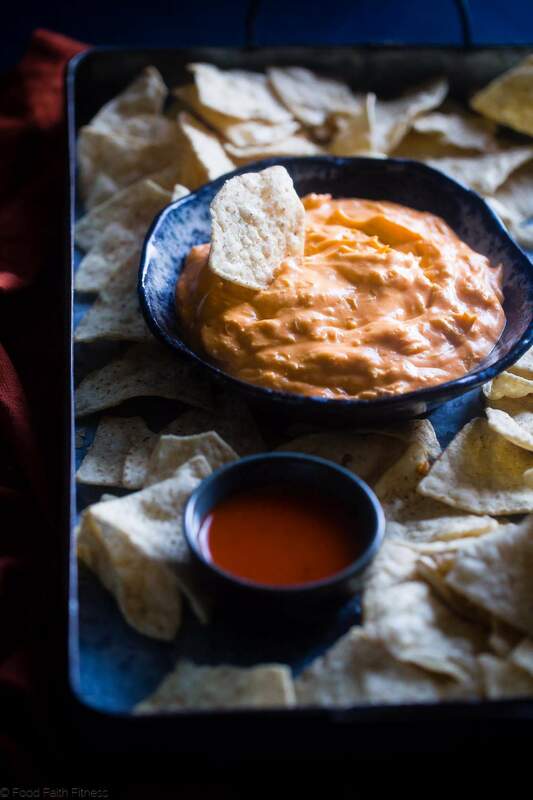 We’re ALL EXCITED to dip-dip-DIPPPPP into super creamy, spicy, protein PACKED buffalo chicken yumminess. Let’s start with the basics, because you might have a few questions. 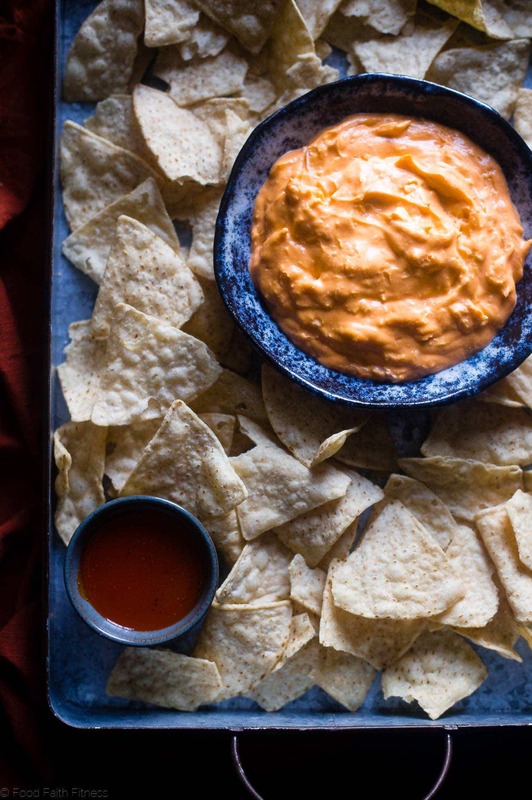 Making buffalo chicken dip is actually REALLY REALLY SIMPLE. 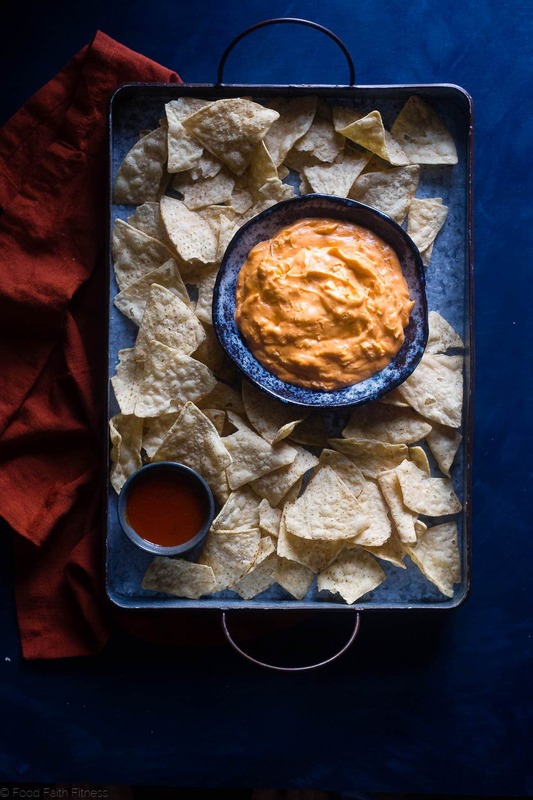 This Crockpot Healthy Buffalo Chicken Dip with Cauliflower requires minimal ingredients: cream cheese, buffalo sauce and chicken (obviously.) Once you round up those ingredients, you just have warm up the cream cheese, so it gets nice and smooth. Then, stir in the buffalo sauce and shredded chicken! Got some leftover rotisserie chicken? PERFECT FOR THAT. In usual Taylor form, I decided to add CAULIFLOWER to make the dip have EXTRA creaminess without having to add EXTRA CHEESE. We’re using Challenge Dairy Cream Cheese here, which is basically the epitome of pure luscious, velvety-smooth rich & delicious food. And it just so happens to be 100% real cream, with N-O-T-H-I-N-G artificial! No hormones. NO additives. NO fillers. We’re straight up talking about real cream cheese with REAL ingredients guys. 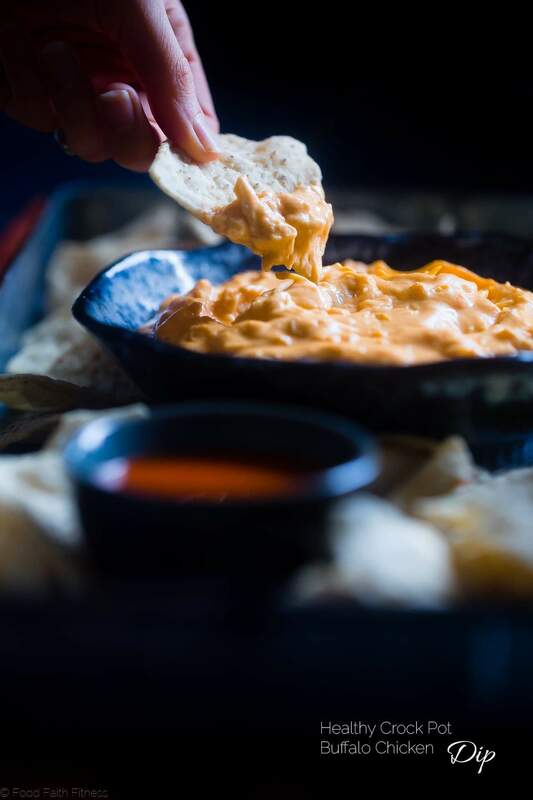 This makes this Crockpot Healthy Buffalo Chicken Dip with Cauliflower taste better and we would not want ANY other cheese to take away from that! I have a problem. I just like it in ALL THE THINGS. That happened once. And, we’ll just leave it at that. Now that we’ve added cauliflower into what seemed like a pretty-easy-totally-can-make-this-happen kinda buffalo cauliflower dip, I see something else on your mind. 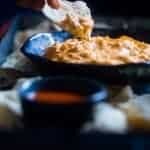 How Do You Make Buffalo Chicken Dip in a Crockpot? 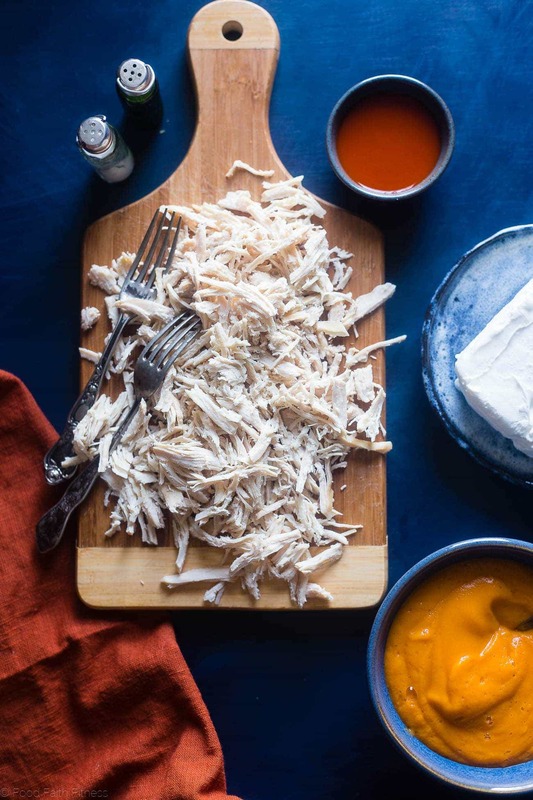 Just like making buffalo chicken dip WITHOUT a Crockpot, you need to get together cream cheese, buffalo sauce and chicken to make this Crockpot Healthy Buffalo Chicken Dip. However, since the Crockpot also cooks things, you’re going to use raw chicken breast. Put your raw chicken into the crock pot, along with the secretly healthy cauliflower. Cover and cook until the chicken is no longer pink, and the cauliflower is fork tender. Use a slotted spoon to transfer the cauliflower into a blender, along with the buffalo sauce and and seasoning. Blend until smooth! Transfer all of that goodness back into the slow cooker, along with the cream cheese. Finally, shred up that chicken and throw it into the slow cooker too! Cook until everything is soft and creamy and DEVOUR! Easy peasy huh? Adding some secretly healthy veggies doesn’t make it ANY harder! Even if you’re one of those people (like me) who has zero desire to watch little men run around on a tv, and one of those kind of people that wear earplugs when the game is on (there is only so much of Mr. FFF going HOORAHHHHHH that I can take) I can PINKY PROMISE that dunking a crispy-crunchy chip through a mountain of creamy, swirls of spicy sauce and tender pieces of chicken are going to get you through it. Realistically, the men-folk will be too busy yelling to even notice that you stole the pot of dip. This Crockpot Healthy Buffalo Chicken Dip uses cauliflower so it's packed with hidden veggies and so creamy! A healthy, gluten free appetizer for game day! In the bottom of a 7 quart slow cooker, pour in the chicken broth. Place the chicken breast in, followed by the cauliflower florets. Cover and cook on high until the chicken is no longer pink inside, about 2-2.5 hours. Once cooked, remove the chicken to a plate to cool. Using a slotted spoon, transfer the cauliflower into a high-powered blender, trying to leave as much broth in the slow cooker as you can. Into the blender, add the buffalo sauce, salt and pepper and blend until smooth and creamy, stopping to scrape down the sides as necessary. Drain the chicken broth from the slow cooker and add the cauliflower/buffalo mixture in, along with the cream cheese. Using two forks, shred the chicken and then add into the slow cooker. Cover and cook on high until the cream cheese is soft, about 20-30 minutes. Once the cream cheese is soft, stir everything together right in the slow cooker, until well mixed. Either serve with chips straight out of the slow cooker, keeping it on warm, or transfer to a bowl to DEVOUR. ** Full fat works better since there is no cheese in this dip, you need that creaminess. THIS POST IS SPONSORED BY MY FRIENDS AT CHALLENGE DAIRY. THANK YOU FOR ALLOWING ME TO CONTINUE CREATING GREAT CONTENT FOR YOU BY SUPPORTING PARTNERSHIPS WITH SUPER-FAB BRANDS THAT FOOD FAITH FITNESS LOVES TO WORK WITH! AS ALWAYS, OPINIONS REMAIN 100% MY OWN! I could easily eat this by the spoonful! I would gladly take a dip! Love the use of cream cheese and cauliflower! This looks so good! I’m going to see if I can adapt it easily for me to enjoy it. I could see me making a huge big bowl, and having a very upset tummy. I hope you can make it work for you chica!! Yay for hidden veggies. This dip looks divine! This looks sooooooooooo dang good!!! I love that you hid some cauli in there. (yay, superfoods!). And I absolutely ADORE the styling with the dark blues. It makes that orange dip POP right off the screen! Thank you Kelly! I love blue/orange together and ALL things cauliflower! Buffalo sauce, what is this? I have never used it, made it or purchased this sauce, so I have no clue. Serious yum! My husband loves anything “buffalo” flavored! As does mine! Thanks Cynthia! You are too sweet 😉 Thanks lady! Oh I have to make this one. Yum!!! You sure do! Thanks Maria! The crock pot and I are absolutely best friends this year, I think I’ve used it every week this winter!! I would have to figure out the dairy alternatives, but I totally love this whole idea! YES! The crock pot IS the best! I love that this is secretly cauliflower!! The hubs gets mad when I try and hide vegetables in his food but I know he would love this!! Mine used to get mad…now he just accepts it haha! I actually really love watching football! Before kids, it was such a great way to spend an afternoon…snuggling with my hubby and eating snacks! Now we don’t have a way to watch it (yep no cable or antenna lol) and we have lots of little people who need our attention…and I actually miss it! However…I could totally spend an afternoon in sweatpants eating ALL of this delicious dip! NO CABLE?! How do you do it!! Thanks for the dip love! So Mr. FFF asked you to make it, and if I recall he’s dairy free. How can he enjoy it? I was just wondering because if you made a dairy free version I would be most interested, life is hard with out dairy. Lol! Recipe looks sooooo good though! I am such a sucker for Buffalo. And cream cheese, really. Winning combo! Yes!! Love all things buffalo! I’m all over this! Ohhhhhhh! I am seriously loving this. Beautiful recipe! This is so perfect for all the big football games coming up! I bet it’s a huge crowd-pleaser, and I love that you snuck in some cauliflower! I bet this recipe is a popular one for the superbowl! I can’t believe how few ingredients it has. Thank you Emily! Yay for sneaky nutrients! I can dunk my face into this and not feel guilty! It has a cauliflower, right ? What a great way to sneak in some veggies! This looks and sounds amazing right now! Going to be making this for our next party for sure! Thank you Meg! Hope you love! Hi I was just wondering about how much is a serving roughly? I know it says serves 10 but then at the bottom you added could serve 8….what size serving is for the nutrition listed? It looks delicious I just want to get a semi close count since I track calories! Thank you! The nutrition is always for what the actual recipes says 🙂 So it is for 10 people – I just wanted to make note in case someone was serving some starving people! I hope that helps! I will watch any game just so I can eat a big bowl of this !! Yum, this was so good. I used a blend of raw cheddar and mayo in place of the cream cheese and served with Siete Foods tortilla chips. I had a few spoonfuls for sure. Thanks for a great recipe! Cauliflower is such a great secret weapon! This dip looks scrumptious!! Perfect way to hid some veggies in something the kids & hubby both enjoy!